I have a 1986 Larson DC215 with a 170 Mercruiser Alpha One out drive. The unit shifts fine in the drive way with the ear-muffs on but tends to kick out immediately back into neutral when it is under power. No particular speed. I've already replaced and adjusted the lower shift cable. I was told that my clutch dog may be worn and needs to be replaced. Sound familiar? If so, how big a job is it to replace the clutch or should I leave it up to the pros? The boat is still in good shape but, we aren't going to spend too much more money on it. On 1984, 1985 & 1986 Alpha models, MerCruiser put the wrong heat treat on a small shifting nut in the lower unit. If yours is worn down to far, you will never get the shift cable adjusted properly. If you take it to the pros, they will sell you a new set of gears and Lord only knows what else. It is possible that the clutch and gears are worn and need to be replaced but a lot of the time you can get away with just turning the clutch around and replacing the small castle nut located at the very inside end of the propeller shaft assembly. If you remove your drive from the boat, you can check to see if you have a bad castle nut without having to disassemble the lower unit. 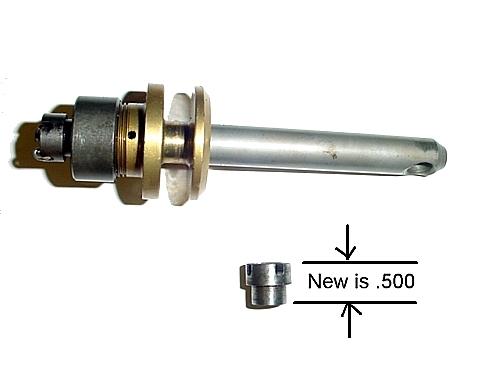 Turn the propeller shaft in a counterclockwise direction while you turn the brass shift lever on the outdrive in a clockwise direction until they both lock up. 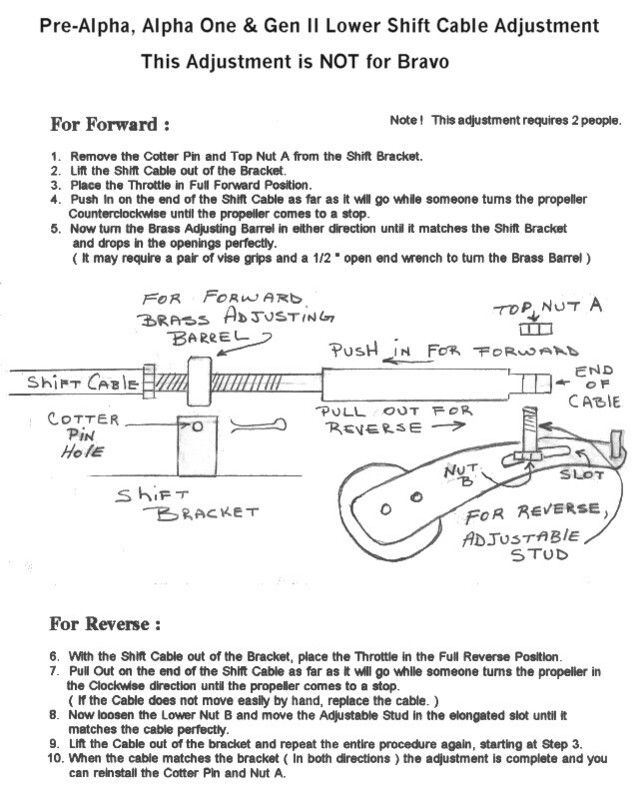 Keep light tension on the prop shaft and see if you have any left to right movement on the brass shifting lever. There should be very little. If you have a lot of movement, the castle nut most likely needs to be replaced. To replace it, the upper and lower housings have to be separated and the lower needs to be completely dissembled. 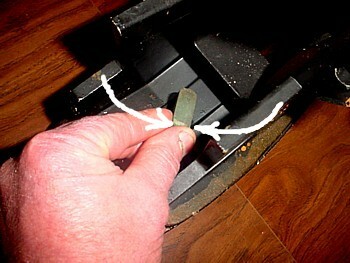 The small castle nut ( shown ) goes on the end of the shift cable spool assembly ( shown ). It is held in place with a cotter pin. In 1984, 1985 & 1986 MerCruiser only put a 10 rockwell on this nut. It was suppose to have at lease a 30 rockwell. The bottom shoulder of this nut, on some drives, will wear down as much as 1/8 of an inch. This makes adjusting the lower shift cable impossible because the cable has to move such a great distance before the shift spool even starts to move the clutch. We make our own castle nuts with a 50 rockwell on them.